WASHINGTON — Recent ethnic clashes erupted in northern Mali this past week and the Malian government blames the Tuareg rebels. 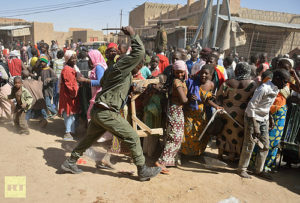 Reuters reports that the northern separatist rebels, the Tuaregs, instigated the violence and unrest. The Tuaregs sued for peace after French intervention threatened to annihilate them and their former Islamist allies. The Tuaregs said that their fighters were not responsible for the attack and said they will continue to honor the ceasefire agreement they signed. At least 4 people were killed in the ethnic clashes, which occurred ahead of the July 28 elections. The French and the West want the elections to happen and stabilize the country against the Islamist threat that nearly toppled the country last year. The Islamists, which have ties to the international terrorist network al-Qaeda, have since retreated back to their mountainous hideouts and fled elsewhere, with some apprehended in Sudan. France has since withdrawn from Mali and left the country in the hands of a United Nations task force composed of several West African countries.